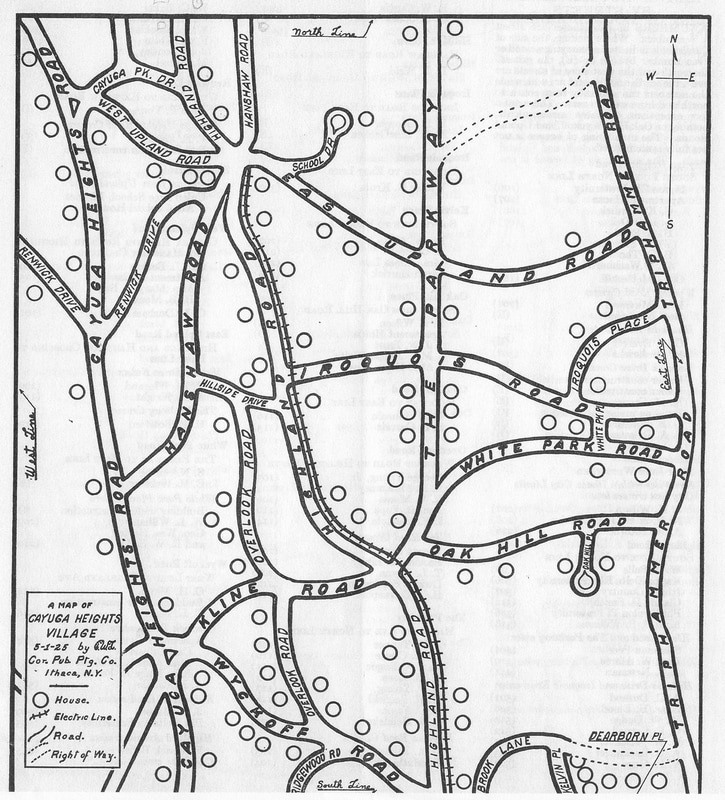 There were twelve sections in the law, the first four of which divided the village into three numbered zones, each given a land use designation. 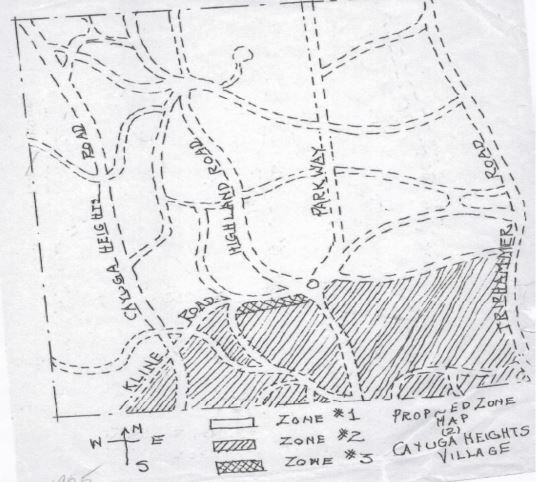 (1) ​The zones are shown on the accompanying map, which, although unsigned, was almost certainly drawn by Carl Crandall, the civil engineering professor at Cornell who served as village engineer until the early 1960s. the small portion of Lake View Cemetery in the southwest corner of the village. ​Section 3 specified that within Zone 2 “Club Houses” were permitted referring to the Country Club of Ithaca then located between Highland and Triphammer roads in the southeast quadrant on the village map, as well as to Cornell fraternities and sororities. According to a commercially published directory, by 1925 there were four fraternities within Zone 2, located on Cayuga Heights, Highland, and Wyckoff roads. Also allowed in Zone 2 were apartment houses of which there also happened to be four. Three of these were occupied by no more than two or three people; the fourth was the French chateau style building with six apartments at 107 Cayuga Heights Road across the street from the Sigma Chi fraternity house. R.W. Sailor, business manager of the Cornell Alumni News, produced this map of the village in 1925. Sailor lived at 210 White Park Road with his family, including his mother-in-law and father-in-law. (1) Village of Cayuga Heights, Tompkins County, New York, Zoning Ordinance, n.d., six pages measuring 3 x 5 inches printed and distributed to village residents in 1926. (2) The Village of Cayuga Heights, Ithaca, New York (Ithaca: Cornell Publications Printing Co., May 1, 1925). (3) John J. Chartres, Examiner, Report to Honorable Morris S. Tremaine State Comptroller of an Examination of the Accounts and Fiscal Affairs of the Village of Cayuga Heights, Tompkins County, N. Y., March 1, 1926 – January 6, 1929, 1. (4) BOTVCH, Regular Meeting Minutes, November 19, 1928: https://lfweb.tompkins-co.org/laserfiche/DocView.aspx?db=CayugaHeights&docid=323010, and a copy of the indenture dated January 9, 1928 by which Jared Newman and his wife Jane Newman gave the village the land on which Sunset Park is located. (5) Jared Newman to “Prof. John Bentley, Jr., President Cayuga Heights Village, 330 The Parkway, Ithaca, N.Y.,” December 9, 1925, reproduced by Carol Sisler for Folder 5, “Correspondence of Charles Blood and Jared Newman, 1916-1937,” Cayuga Heights Collection, V-61-1-1, The History Center in Tompkins County from the Jared Treman Newman Papers, Collection 2157 held at the Division of Rare and Manuscript Collections, Cornell University Library. (6) Sisler, Enterprising Families, 120.